The Commentarii Collegii Conimbricensis Societatis Iesu. In libros Meteororum Aristotelis Stagiritae was published in Lisbon, in 1593, by the Publisher Simão Lopes (230x170mm). As happens with almost all the titles pertaining to the Coimbra Jesuit Aristotelian Course, this volume too was composed by the Portuguese Jesuit Manuel de Góis (1543-1597) and as regards a possible conjecture of the years in which it was composed the reader is advised to consult the equivalent introduction to the first volume of the entire Coimbra Jesuit Aristotelian Course, viz. on Physics. At its front page it is mentioned that all the necessary privileges, approvals and licenses can be read at the beginning of the volume On the Heavens. As a matter of fact, this volume belongs to the editorial series published in Lisbon and as such it is the second one: after On the Heavens but previous to the Parva Naturalia (since this one explicitly mentions the Meteorology). Besides the indication of the year of its publication, the only dates that can guide us as to the pace of the edition of this Lisbon sub-series – a second phase of the publication of the Coimbra Jesuit Aristotelian Course, as indicated in the equivalent introduction concerning the volume On the Heavens –, are those of the On the Heavens – September 2nd, 1592 – and on Ethics – May, 20th, 1593. From what has been written in that introduction, it is known that the Meteororum as well as the Parva Naturalia, were examined in September 1592. With the exception of the volume of the Dialectics, this title reproduces in its cover the logo of the Society of Jesus, with the Latin motto, “Nomen Domini Turris Fortissima”. The volume on Meteororum is the first volume of the entire Coimbra Jesuit Aristotelian to follow a different style, which will be also adopted by the Parva Naturalia. 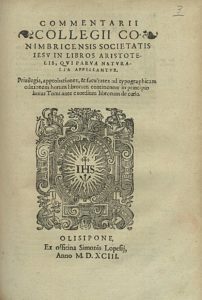 The Preface (Prooemium) of the Meteororum indicates and justifies such a method of brevity: the omission of the Aristotelian text, as well as the lesser investment in the division of the questions, is due to the lack of time for lecturing the whole cycle of Arts within the period of time prescribed for it; furthermore, it is decided that the Jesuit perspective on what Aristotle had sparsely written should be summarized and put together under a few chapters, and, it is said that with a choice like that – namely, thirteen treatises divided into chapters – the Coimbra Jesuits aimed at turning such an enjoyable subject matter into an even more enjoyable and profitable lesson. One last information is given: some questions that certain authors use to deal with in Meteorology (viz. the movements of the planets and the dependence of the sublunary world from the heaven) will be skipped because their examination had also been properly done in the volume On the Heavens. The Commentarii Collegii Conimbricensis Societatis Iesu. In libros Meteororum Aristotelis Stagiritae has only a General Index and 143 pages in the whole. Nevertheless, it is the second largest of the volumes published in Lisbon, immediately following the one On the Heavens.